Serving Mississauga and the Greater Toronto Area for over 16 years, Tranquility Funeral Services provides you with a low cost, all inclusive alternative to traditional funeral homes and services.We offer an array of affordable options in terms of visitations, receptions, memorials, cremation and burial arrangements. 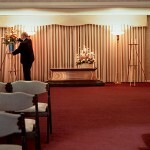 No matter how traditional or “unique” your funeral needs, we have the resources and facility to make it happen. Call Tranquility Funeral Services today. Our prices are often 50% lower than those of other funeral providers. This is possible because we are partnered with St. John’s Dixie Cemetery in Mississauga, which provides visitations, receptions, chapel services and cremation and/or burial — all in one location. Along with eliminating the need to travel to and from various locations during the course of an already stressful day, this convenient arrangement keeps our overhead low. At Tranquility, we pass these savings on to you – without ever sacrificing compassion, quality and professionalism. Tranquility maintains a list of qualified clergy representing every denomination, (including Sikh, Hindu and Humanist) who regularly perform ceremonies at the St. John Dixie chapel. Perhaps you’d prefer to hold a service at your own house of worship instead. Or maybe you wish to hold a visitation in your home or church. You are under no obligation to use the facilities provided by Tranquility. Whatever you decide to do, Tranquility will gladly arrange all preparations and transportation to and from various locations throughout the Mississauga area. As you can see, there are many details involved in even the simplest funeral. That’s why we invite you and your loved ones to contact Tranquility to make affordable arrangements that reflect your values.